With a Republican president in the White House, Texas health officials are seeking to restore federal family planning funding they gave up under the Obama administration to take a stand against Planned Parenthood. Under the defunct Medicaid Women's Health Program, Texas received $9 in federal money for every $1 it spent on reproductive health care for the poorest Texas women, accounting for millions of dollars every year. State and federal law already prevented taxpayer dollars from being spent on abortion. But when GOP state leaders took the further step of ousting Planned Parenthood clinics from the program in 2011 — an effort to punish providers that perform abortions at some of their locations — they lost the federal match and had to finance it alone. Now, amid dropping participation in its programs, the Texas Health and Human Services Commission is preparing to submit an application to get that money back — for a state-run, Planned Parenthood-free women's health program now called Healthy Texas Women. Texas' request of the federal government presents a potential quandary for President Donald Trump's administration: While he has signed legislation aimed at keeping tax dollars away from groups that perform abortions, federal law currently lets patients on Medicaid — the joint federal-state program for children, the disabled and the very poor — choose between "any willing provider." If his administration gives Texas the go-ahead, other states could follow, as could lawsuits. Stacey Pogue, senior policy analyst for the liberal Center for Public Policy Priorities, said during a Monday public hearing on the proposal that she feared it “would invite litigation.” She said Medicaid patients have a legally bound “freedom of choice" and that abortion providers and their affiliates would probably sue to protect it. She also said the state's history of cuts to reproductive health, and its year-over-year efforts to edge Planned Parenthood out of taxpayer-funded reproductive health care, have been shortsighted. “We have tried for five years in order to repair the provider network that was damaged with family planning cuts and removing Planned Parenthood," Pogue said. "That damage still has not been repaired." Jami Snyder, the health agency's associate commissioner for Medicaid and the Children’s Health Insurance Program, said at the hearing that the proposal is "an opportunity to draw down federal funding." Under the Healthy Texas Women program, low-income Texas women ages 18 to 44 are eligible for services including pregnancy testing, STD testing, breast and cervical cancer screenings, contraceptive counseling and postpartum depression screenings, as well as help with chronic diseases such as diabetes, high blood pressure and high cholesterol. The state could use the help; since leaving the federally funded Medicaid Women's Health Program in 2012 and forcing out Planned Parenthood, tens of thousands fewer women have received care through Texas' patchwork of programs. Legislators have so far been willing to make that sacrifice in order to keep Planned Parenthood out; they say any dollar spent on the organization's services helps underwrite abortion — even indirectly. Planned Parenthood officials have repeatedly stressed that their abortion services are provided separately from other reproductive health services and are not funded by public dollars. The organization's latest annual report shows 3 percent of all Planned Parenthood health services are for abortions. Emily Horne, senior legislative associate for the anti-abortion group Texas Right to Life, said that the Healthy Texas Women program has better capacity to serve more people than Planned Parenthood does, particularly in rural areas. She also said continuing to exclude abortion provider affiliates is in line with the Legislature's previous stance on abortion. "For those who believe abortion is the killing of an unborn child, we don't want to subsidize that through our tax dollars," Horne said. "It's morally abhorrent for us." But Planned Parenthood advocates have said the organization is an asset for women's health care. Blanca Murrillo, who testified at Monday's hearing, explained how Planned Parenthood saved her during college, providing contraceptives and other reproductive health care after she lost her Medicaid coverage. 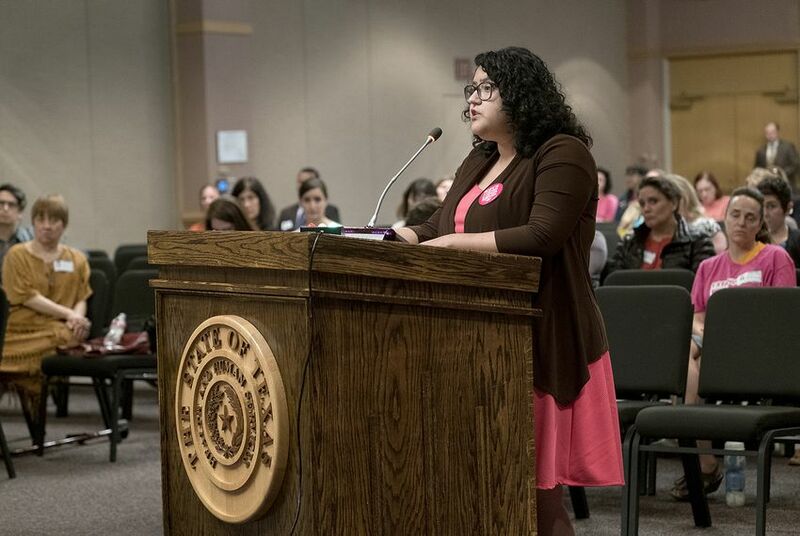 “A strong Healthy Texas Women program should include Planned Parenthood, and I’m asking the state to choose the health of Texas women, which it has a duty to protect, over scoring political points,” Murrillo said. Yvonne Gutierrez, executive director for Planned Parenthood Texas Votes, called the decline in state services to Texas women "troubling," and said Texas is providing a crucial test for the Trump administration. "We have a state that's now going to the federal government to say essentially, 'Fund this program for us so that we can continue to do a disservice to the women in Texas,'" Gutierrez said. "It's just unfortunate and completely unfair to the women who actually desperately depend on this care." The Healthy Texas Women program is the state’s second attempt at reimagining how to provide health services for low-income women without organizations that provide abortions at some of their locations. Women's health organizations in Texas say a President Trump-signed measure targeting abortion providers will not have an affect here — yet. But it could in the coming years. A high-ranking official at the Texas Health and Human Services Commission is resigning after he co-authored an unflattering study that found the state’s exclusion of Planned Parenthood from a family planning program restricted women’s access to health care. Disclosure: The Center for Public Policy Priorities and Planned Parenthood have been financial supporters of The Texas Tribune. A complete list of Tribune donors and sponsors is available here.